Celebrate Valentines Day with a Run! Celebrate Valentines Day with a difference this year and come and join me in supporting Bethany Christian Trust, by running the 5km Partner Run. 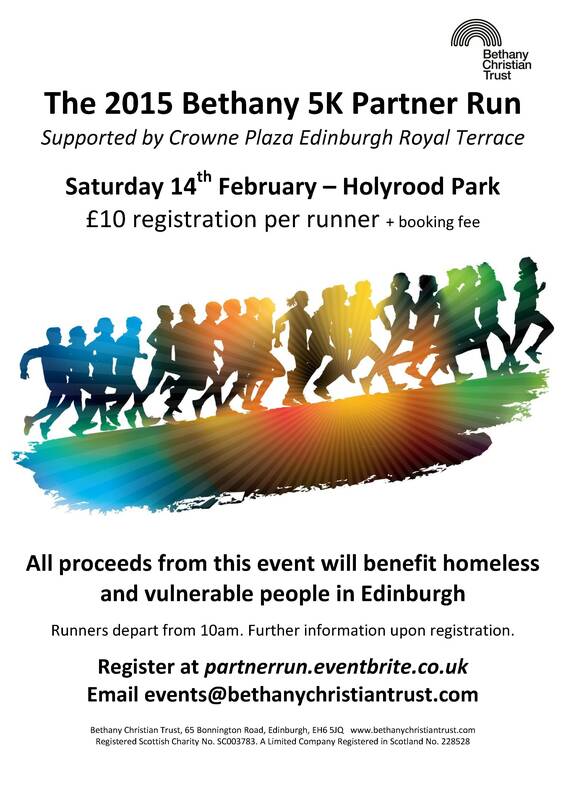 As part of my role within Crowne Plaza Edinburgh – Royal Terrace, I have teamed up with our chosen charity, Bethany Christian Trust, to hold a 5km fun run at 10am on Saturday 14th February. It is £10 to enter, and all proceeds go directly to the charity to benefit homeless and vulnerable people in Edinburgh, so a very worthwhile cause. So grab your partner, a friend or family and come and join us for a fun morning in one of Edinburgh’s most fantastic locations, Holyrood Park. Hope to see you there.